When iPad Pro was announced they made a big fuss about Adobe Photoshop coming out in 2019. You don't have to wait for that to happen. 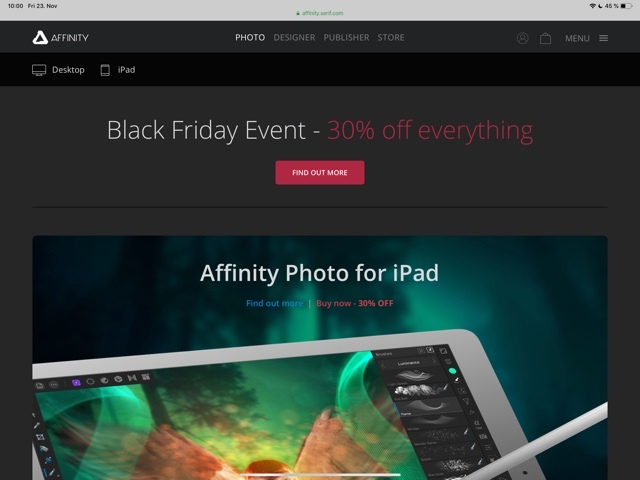 Affinity has some great tools that replace Adobe apps: Affinity Photo (Photoshop), Affinity Designer (Illustrator) and soon Affinity Publisher (InDesign). Very affordable and well done. Today they are 30 percent off. Go get them. Tja auf den Publisher warte ich schon länger. Die Publisher Beta ist für Mac bereits verfügbar und läuft - bei mir - ohne Probleme. Man kann sich schon mal rantasten. Thank you very much for the recommendation - shall give this a go. I see that these are products of Serif software: I was an early adopter of PagePlus back in 1991 - the first time a Pagemaker-type package had become available at a price that ordinary (non-corporate) mortals could afford.